These beautiful Illuminated Pumpkins from Lisa DeNardi are easy and fun Halloween crafts that you can have out all season long. 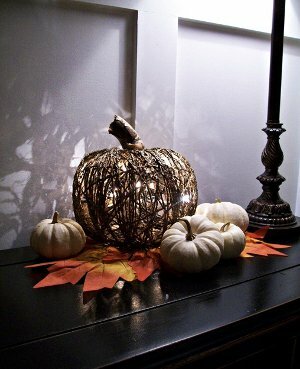 Made with twine and white glue, this easy dollar store craft can help add an elegant and classic look to your autumn decor. Dollar store projects are great for Halloween because they mean you can spend more money on goodies and less on decorations. This easy craft for Halloween will make you and your family glow with delight. I used two plastic containers. One to pour the glue into the other to hold the inflated balloon. Blow up the balloon to the size you want your pumpkin to be. I intend to make a couple more in different sizes to accompany this one. Pour some white glue into one of the containers. I used a foam brush to paint the entire balloon with glue, although you really don’t need to use the foam brush you can use your gloved hands. 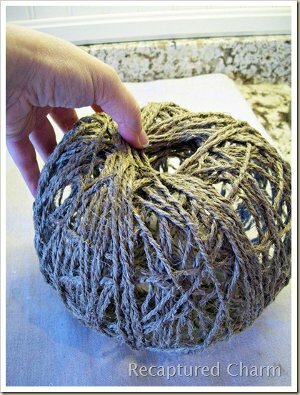 Cut a good length of twine and dip the entire cut piece into the container with the glue. Cut it as long as possible but not too long so that it gets all tangled up. 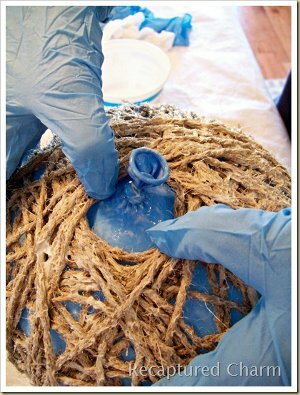 Start gluing your glue covered twine to the balloon starting at the bottom. 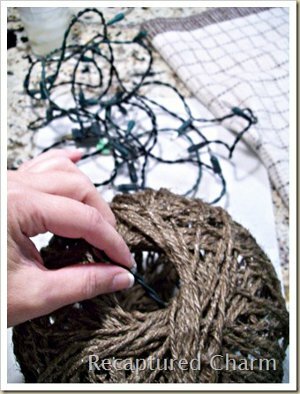 Make sure to tuck your loose ends in behind the other twine nice and neatly. Go in all different directions, leave some obvious holes, it doesn’t need to be perfect. 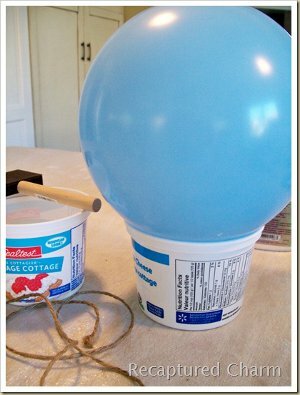 Leave a hole at the top and at the bottom of your balloon. Just get your fingers in there and pry the wet twine apart into a nice neat hole at both ends. The top hole doesn’t need to be too big, just big enough to insert a stick or stem. The bottom hole should be slightly bigger. Big enough to place your pumpkin over a battery operated tea light or to insert your twinkle lights. 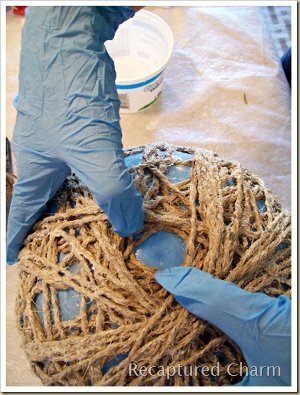 Run your glue covered hands (and they will be) over all the twine, then place back on your container and allow to dry. Remember to turn it around so the bottom dries too. When your pumpkin is ALMOST dry (mine took about 2 hours) it will still be slightly pliable. Pop the balloon. Be warned that your twine will still be stuck to the balloon and the entire pumpkin might seem to cave in, but you’ll be able to get it back into shape. Once the balloon is out of the pumpkin, take your hands and make an indent at the top to form the top of the pumpkin, where you will eventually put your stem. 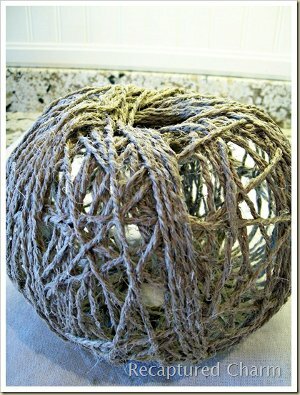 After you get the correct shape allow to completely dry, twine will be very hard. So now your pumpkin will be stiff and have a hole at the top and bottom. At this point you can paint your pumpkin whatever color you choose. I chose two colours. I sprayed mine with the dark bronze first and them lightly sprayed it with gold. Both paints I already had on hand. Glitter would be great as well, if you’re a glittery type of person. For the lights, you can certainly use a small string of twinkle lights the way they are, but I found them a bit too green this way. So I took some black spray paint and sprayed the cord being careful not to spray the lights. I didn’t get the entire cord black, just enough to take away some of the green. Insert your lights into the bottom of the pumpkin, allow them to bunch up. At this time of year it’s not hard to find a branch or twig. The half dead tree in my yard provides me with twigs and dead branches all the time. Insert the stem, glue it in place. Stand back and enjoy. If you're not big on pumpkin guts and carving knives, try a fer more creative approaches to pumpkin decorating this Halloween with these 17 Pumpkin Patterns: Free Projects for Halloween. To make this free craft pattern, we recommend the following materials. They are all available at a great discount at CutRateCrafts.com! This is such a pretty project. When I first saw it I thought it was made from twigs, but it is twine and glue. I have made lamp shades for hanging lamps with yarn this way. It is incredibly messy, but if done right it is so nice. I love the lights inside. Such a nice touch. Lovely and so easy to do once you understand the general idea behind it! For me, it's gotta be painted black, with a layer of maybe a purple or orange glitter paint layered on top. I'd put those dark purple lights inside, too. Or I would use an orange string of lights. Wow this illuminated pumpkin is so super cool and looks like a lot of fun. I remember doing those Easter egg with string when I was real fun and they were so neat sitting in that basket and I know this pumpkin will be even cuter. I love that bronze color it adds some elegance to the pumpkin and I like that you can carry this decoration all through the fall. When adding the flameless candle it will be just that perfect added touch to warm any room. Such a great tutorial. Anyone make this yet? This is just so cute. I am going to try it. It is like the old paper mache. I love how easy it is to make too. Combine that with how inexpensive it is and you have a great project. Cute, easy and cheap. All of them are my favorite words. My grand daughter will love making this with me. Very cute project. I love the idea of painting it copper, too! This would match very well with almost any rustic style of decor. Every year I make a new fall decoration and I made this last week. The 2 changes I made was I spray painted mine using a copper spray paint. And since I was steaming a pumpkin that day, I used a real pumpkins stem. Got a lot of good reviews on this pumpkin. Thanks for the craft. Fantastic project!! When I was a kid we had a babysitter who showed us this and we made Easter Eggs! Such a fun time and yes it was messy with 6 kids doing this but she covered the table with newspaper first. I love the pumpkin idea and these can be made with all the cool strings and twines in colors :) Thanks for reminding me what a neat project these can be!